No, this watch is not really called “Aviator Mamba”. That is the name I gave it after taking this picture. This watch’s real name is a much more mundane “Aviator 2623/1225556-45” which is really too bad considering how beautiful this watch really is. In particular, the soft but clear contrast of the green markings and the white dial is both extremely clear and very pleasant. The super-luminova on this watch might well be the largest and brightest I have ever seen on any watch. The overall “readability” of the dial is outstanding in both day and night (the watch’s 45mm size definitely helps here). The mechanism inside this watch is the highly dependable Poljot 2623 (Antishock. Frequency: 21600 vph. Daily rate from -20 to +40 s/day. Power reserve minimum: 40 h). One special feature of this model is the small magnifying glass which makes the date easily readable. 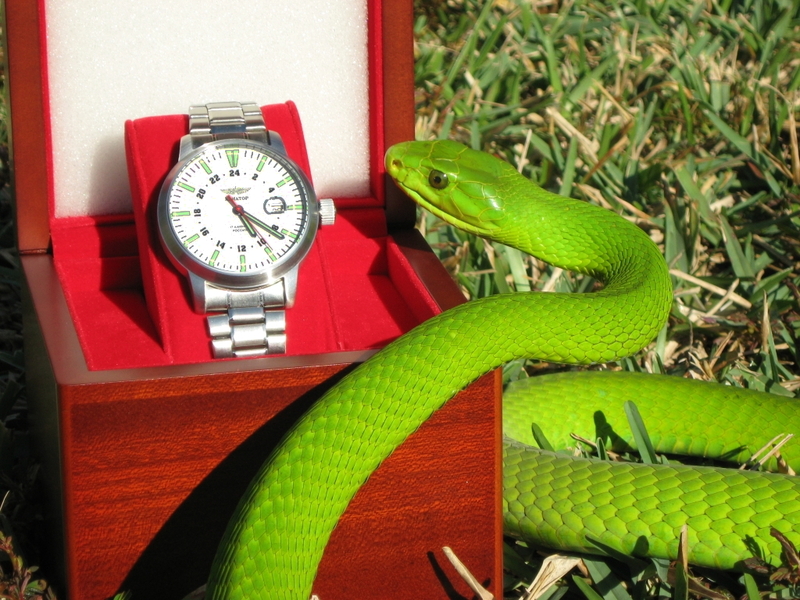 The overall “feel” of this watch is one of strength, power and elegance, hence my choice of a Green Mamba as its model (I could never have taken a close-up picture of this extremely dangerous snake without the help of my friend Carl Barden, Director of the Medtoxin Venom Laboratories and the absolutely amazing Reptile Discovery Center in Deland, FL. Thanks Carl!). This “Aviator Mamba” is both so functional and elegant that it can be worn on any occasion and I have made it my everyday carry (EDC) watch.